Sadly I do not recommend this at all. Not a wedding type of tent. Cheap material. It kept falling apart. We had to reinforce the poles. Zero stars. I put the tent up and it only lasted one day. We had a little wind and the metal was to--cheap to withstand the wind. The tent collapsed and bars bent. What a waste of my hard earned cash. I am one very disappointed customer and will not buy anything more. I give it 0 stars or so I tried. However to have a review it needs a star. It was perfect and arrived just on time. 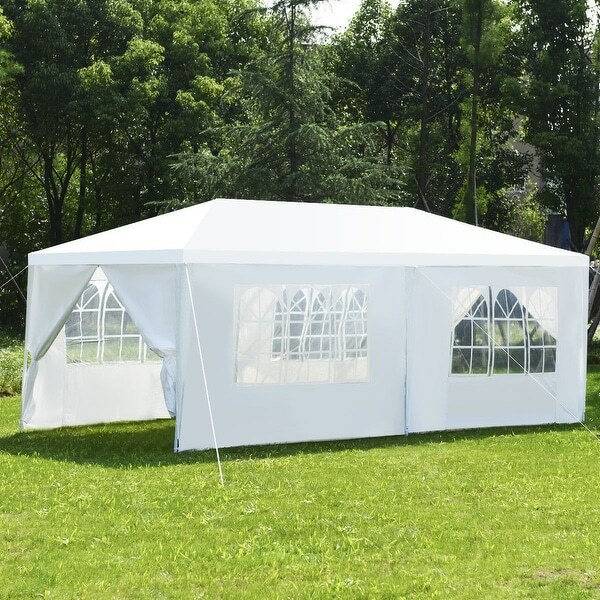 "What is the size of the tent/canopy when collapsed for storage? Also, are the legs height-adjustable? Thank you!" It looks like the previous one I owned, except it is white. looks great, seen at friends place.